The “Me&Sea” project focuses on the close and deep relationship between an island and its surrounding seas. This is, particularly, the case of the Sicilian city of Messina that survived in 1908 a terrible earthquake and tsunami. The city lies on 56km of coast exposing on the Strait of Messina and its port is both the first entry and last exit door of the island. 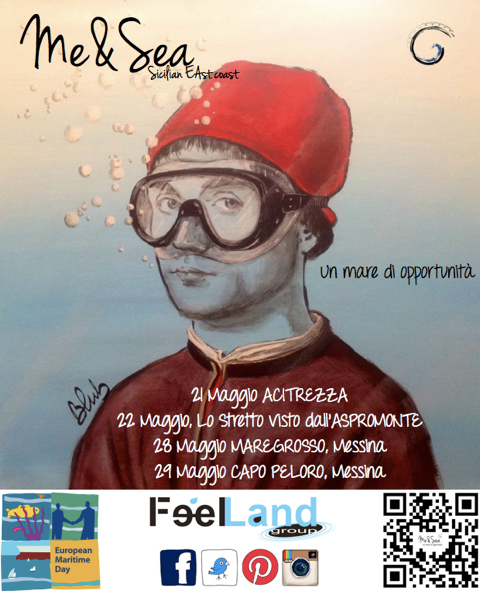 The project, in its second edition, wants to highlight the relationship between the city and its people with the sea. Indeed the name of the project combines the word ME (the international code of Messina) with SEA. Following the experience of the first edition based specifically on the “Strait’s system”, this new one will enlarge the project to all Sicilian East Coast: from Acitrezza, near Catania, through Reggio Calabria’s mountain, to arrive and finish in two different Messina’s districts, Maregrosso and Capo Peloro. The event becomes an opportunity and a trip around Sicilian east coast, where Messina represents a link between island and the European continent. As per the following agenda, the project includes art exhibitions, performances, guided tours, sports and environmental activities. 21th May, Acitrezza (CT). Area Marina Protetta ISOLE CICLOPI. Sea and cultural activities, conference and music performance. 22th May, Aspromonte. Excursion to Reggio Calabria’s mountain to observe the Strait from different point of view. 28th May, Maregrosso district -Messina. Sea and cultural activities & opening ceremony of mural art and music performance. 29th May, Capo Peloro district -Messina. Sea and cultural activities on the point at the far end of Messina and Sicily, just in front of Calabria.